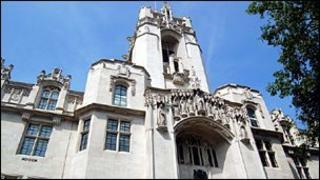 Three former Labour MPs facing criminal trials over their expenses claims have taken their case to the Supreme Court. David Chaytor, Elliot Morley and Jim Devine, who deny theft by false accounting, argue that Parliament, not the courts, should hear their cases. Nigel Pleming QC, representing two of the men, told a panel of nine Supreme Court Justices that the MPs were protected by Parliamentary privilege. Earlier this year the Court of Appeal ruled that they were not. In July the Lord Chief Justice, Lord Judge, heading a panel of three Court of Appeal judges upheld a ruling by a judge at Southwark Crown Court in central London that the three were not protected by privilege. On Monday Mr Pleming, representing Mr Chaytor and Mr Devine, said taking the case to the Supreme Court was "not, and never has been, an attempt to take them above or outside the law". He argued important issues of principle were raised by the case adding that as far as he was aware, they were the first criminal prosecutions of MPs "in relation either to a statement made in or to Parliament or its delegates, or based on a member's dealings with Parliament - for over 300 years". Mr Pleming said the allegations made against the three must be "dealt with by the correct law, the law of Parliament" and argued that only Parliament could question and impugn statements made in Parliament. The three MPs argue that the charges against them involve questioning or impugning proceedings in Parliament. Mr Pleming argued the expenses scheme was created and is administered by Parliament for Parliamentarians: "The administration of the scheme is also entirely a matter for the House of Commons - this extends not only to its creation but to its regulation and enforcement." Prosecutor Lord Pannick QC will argue during the two-day hearing that parliamentary privilege or immunity from criminal prosecution has never attached to criminal activities by Members of Parliament. Former Bury North MP Mr Chaytor, 61, of Todmorden, West Yorkshire; former Scunthorpe MP Mr Morley, 58, of Winterton, north Lincolnshire; and former Livingston MP Devine, 57, of Bathgate, West Lothian, are all due to face separate trials at Southwark Crown Court. The Supreme Court judges are expected to reserve their ruling on Tuesday.